A return to campus signals the return of Bison athletics for the 2018-19 season. Winners of eight conference championships a year ago, the Bison took home the Summit League Commissioner’s Cup, not to mention the FCS title representing the Missouri Valley Football Conference. The title defense begins this fall, so keep an eye on these upcoming sporting events. The Bison made a splash in their first Division I match under new head coach Mike Regan’s tutelage. North Dakota State downed Green Bay 4-1 on Aug. 19. If it wasn’t for two NDSU attempts that clanged off the post in the first half, the margin of victory could have been dramatically altered. The scoreline was significant as it represented a mark in goals scored reached only once in last season’s campaign. Additionally, the Herd’s 10 shots on goals would have been the second most achieved last year. Both are excellent signs that Regan’s new tactics have given an offense that took 10 games to score its first goal last year a much needed shot in the arm. Forwards Holly Enderle and Mariah Haberle linked up to form a lethal scoring tandem against Green Bay, catapulting the offense. They lead the Bison in Regan’s first home match and another test that the Bison have turned a corner. NDSU returns to the site of their 2017 Summit League Tournament triumph at ArborLinks, but this time to kick off their 2018-19 season. The event features four other conference opponents in Omaha, South Dakota, South Dakota State and North Dakota in their inaugural season in the Summit League. The matchup offers reigning Coach of the Year Matt Johnson a chance to take stock of his squad this season with other conference foes providing a barometer. How the team copes with the loss of Natalie Roth — last year’s Golfer of the Year — will be crucial to determining their success in the upcoming season. Senior Emma Groom seeks to assume the leadership post, while Taylor McCorkle and Sierra Bennion aim to build off of top-six finishes at last year’s championship. The Dakota Marker trophy has maintained residence in Brookings, South Dakota for two straight years, raising the stakes of this year’s rivalry meeting. Not only are bragging rights on the line, the game is also NDSU’s first conference matchup of the season, heightening the tension in what is already a critical matchup. Suffering major losses on offense, the Jacks return to Fargo as a different team than the one that bossed NDSU in back-to-back years. Signal caller Taryn Christion remains, but losing go-to receivers Dallas Goedert and Jake Wieneke drastically alters what was a dynamic offense. The two-headed monster torched the Bison for 433 yards in the past two games, making their departures starkly obvious. It’s likely head coach Chris Klieman will use this game to further cement his depth chart and rotation of players. It also offers Klieman his first chance to assess his squad against a top-tier foe. A win here could springboard the Herd into a run of victories in conference, plus bring the rock back to its rightful owners. NDSU and UND have met on the volleyball court 151 times, but Oct. 12 will be the first time the two square off as members of the Summit League. The Fighting Hawks shift their conference allegiance from the Big Sky to the Summit League this year, enhancing an already intense in-state rivalry. The Bison hold a 79-71 advantage in the all-time series, but UND has won six of the last eight meetings, including a straight set victory in Grand Forks a year ago. This season’s match in the Bentson Bunker Fieldhouse will be the second leg of a home-and-home between the two. The additional match ought to fan the flames between the Bison and the Fighting Hawks, especially given the conference stakes. 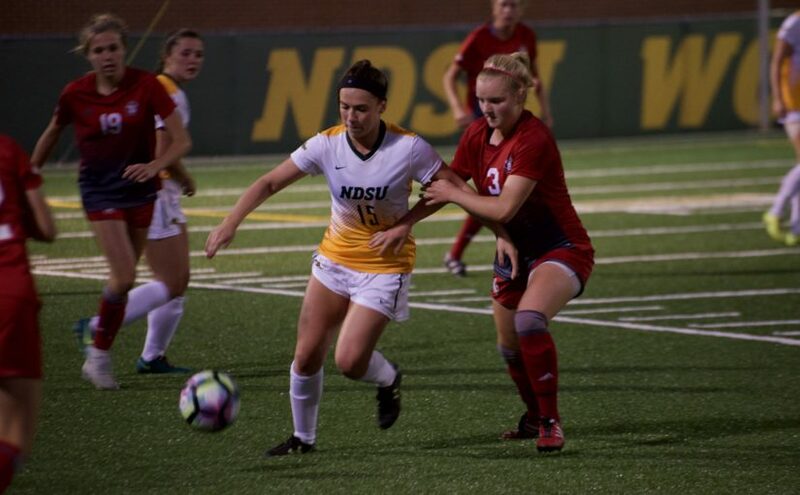 NDSU graduated four critical seniors, but key cogs McKenzie Burke, Abbi Klos, Bella Lien and Allie Mauch return for the Bison.